As one of the Taiwan Ministry of Education’s (MOE) overseas offices, the Education Division of the Taipei Economic and Cultural Office (TECO) in Houston is commissioned to promote the education of Taiwan in the United States. 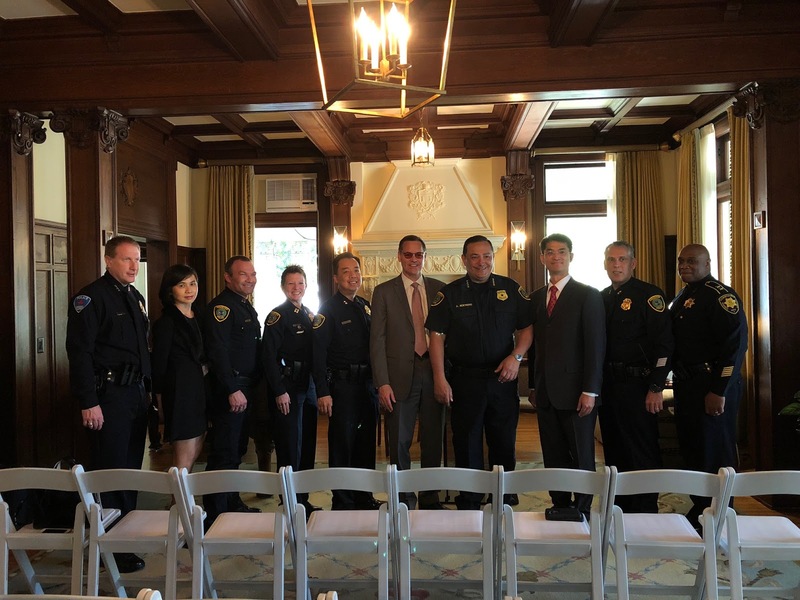 Recognizing the fast-growing Chinese speaking population in Houston, the Education Division teams up with the University of St. Thomas (UST) to provide Mandarin Chinese language training to Houston police officers. The program inauguration reception was held at UST on March 22, 2018 to welcome Houston police officers for their engagement in this initiative. Director General Peter Chen of TECO in Houston, Dr. Richard Ludwick, president of UST, Houston Police Chief Art Acevedo, Captain Kristine Anthony of the Houston Police Academy, Harris County Precinct 1 Constable Alan Rosen, and fifty more officers across the Greater Houston Area joined in celebrating the beginning of the program. This initiative is the first collaboration in education on the government level between the City of Houston and Taiwan MOE in conjunction with the educational institution, UST. The objective of the program is to build officers’ basic skills in Mandarin listening comprehension and speaking, in the meantime to help them obtain a better understanding of the Chinese speaking communities and cultures. UST’s adjunct professor, Dr. Maria Mar, will be the instructor of this program. The course will put emphasis on basic words and simple sentences in Mandarin about policing activities and routines. Nonetheless, Dr. Mar noted that her class agenda is open to officers’ suggestions for a more pragmatic approach. Police officers from the South Gessner, Southwest, Westside, and Midwest stations, in which areas many Chinese speakers engaging in various activities commonly, are given the priority for the class registration. The class was set to accommodate twenty-five students at first. However, thirty students were accepted for the first session due to the high numbers of applications. The program will run two sessions in one year span. Each session consists ten weeks of ninety-minute lessons each week. Captain Anthony noted that just by saying simple phrases like “hello, how are you, my name is…., thank you” in a person’s native language will only mean so much to that individual. As fluency is not the key to this training but a practical way to engage officers in the Chinese speaking communities in Houston. 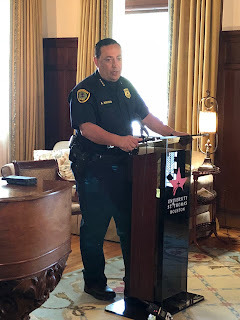 To encourage utmost learning outcomes, Chief Acevedo announced in his remarks that he will have a dinner with the participant who accomplishes the best out of the program as a reward.